- GEICO Honda and Lucas Oil/Troy Lee Designs Honda rookies Matt Bisceglia and Shane McElrath made their respective professional debuts at Unadilla. The new Horizon Award winner, Bisceglia, got off to a rocky start crashing in the first moto but bounced back to score his first career points with a nineteenth in the second moto. Meanwhile, McElrath, who is dealing with a shoulder injury, finished eighteenth overall via 17-17 moto scores. - Rockstar Energy Racing has been decimated by injuries during the Nationals. And when their lone rider for the weekend, Jason Anderson, got up slowly after a hard crash in the second moto, it looked to have gone from bad to worse. Luckily Anderson just had the wind knocked out of him and will be okay for Utah. The team will also have reinforcements as they have signed Michael Leib for the final two rounds and hope to have Ryan Sipes back after he underwent surgery on a broken knuckle last week. 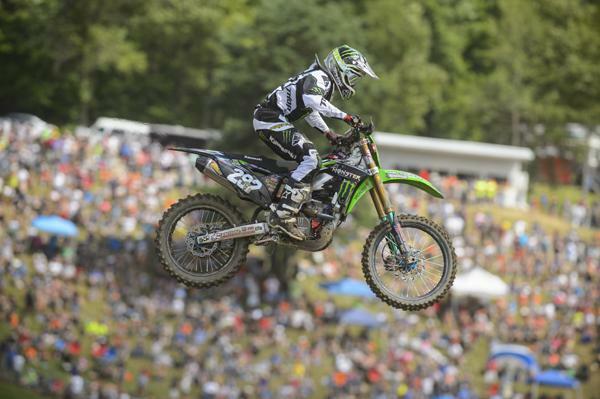 - Anderson had a rough one at Unadilla, which was a bummer after his first career National podium at Millville. This time, he crashed twice in the first moto and twice in the second moto, and the final hit in the second moto knocked him from the race. Anderson has been running sixth in points all season long, but Jeremy Martin has now overtaken him for sixth by a single point. - It’s been a long, albeit abbreviated, season for Monster Energy/Pro Circuit Kawasaki rookie Adam Cianciarulo. Salmonella poisoning keep the highly acclaimed rookie out for the first four rounds and Cianciarulo recently found out that he has also been dealing with an iron deficiency—which was caused by his bout with salmonella. Cianciarulo told us he’s tired every morning and couldn’t figure out why, until tests showed he needed to start taking iron pills. 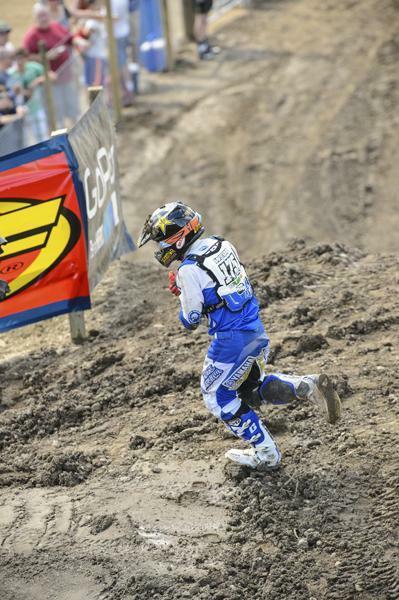 After the motos, AC told us he did feel a little stronger than he did in the first few races. AC has been dealing with an iron deficiency, but said he is beginning to feel stronger. - Oh, but that penalty. Cianciarulo was bumped off the track in the first turn of moto one, and then took, ahem, a long time to rejoin the track. He was penalized ten positions in the moto, dropping him from ninth to 19th. Adam took full ownership of the situation, explaining that he was bumped off the track while entering the first corner around fifth, so he figured as long as he entered a few positions further back then where he was bumped off, he’d be okay. And he did actually come back on a track a few positions further back then where he was when he went off. But the problem was how long it took him to get back on! AC said he saw a ton of banners ahead of him and figured there would be no chance to reenter until the third turn. “So I started breaking to the left to get over there and then I saw a hole open in the banners to the right, I missed it,” he said. - As first reported on Sunday MyPlash/Star Racing rookie Cooper Webb gutted out a twelfth place overall finish after preliminary reports were that he may have broken his arm following a huge crash in practice. Webb hit his funny bone on a rock in the crash that caused strange pain and numbness similar to a broken arm. He will go in for X-rays this week as a precautionary measure, but should be a go for Utah. - Lucas Oil/Troy Lee Designs Honda sophomore Jessy Nelson was back for the first time since Hangtown. An elbow injury sidelined the 2012 Rookie of the Year the last seven rounds. Nelson finished thirteenth overall in his return. - Alex Martin was back in form following a concussion that “left him sleeping” keep him out of Washougal. 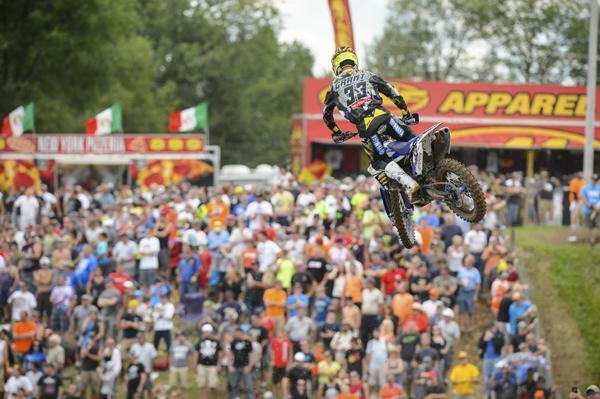 The Minnesotan said things were coming at him at a faster rate than normal at Millville. He stated following the race that the week off helped a lot, and that he has hopes to secure a top ten overall before the season is over. - Rookie Brady Kiesel has left Rock River Racing Yamaha and received help from his former team, Eleven10 Mods, this past weekend at Unadilla. Rumors were floating around the pits that Kiesel may have secured a fill-in roll with SmarTop/MotoConcepts for the final two Lucas Oil Pro Motocross rounds at Utah and Lake Elsinore. We will continue to update this developing story. - While JGR Toyota Yamaha’s Josh Grant had a good run at Unadilla for fourth overall in the 450 Class, it was not without incident. On the last lap, Grant crashed and hit a rock, slicing a massive gash in his elbow. It was so bad that his glove started to fill with blood! Grant gutted out the finish and then went to the Asterisk truck, and had to get 12 stitches. Josh Grant continues to improve down the stretch. - Newly crowned MX1 Canadian National Champion Brett Metcalfe returned to Lucas Oil Pro Motocross at Unadilla. Riding under his own deal, Metcalfe didn’t have the same success as he did at Southwick, his only other National raced to date, but still had a good performance finishing seventh overall. - Justin Brayton, one of many riders collected in a huge first turn pileup up in the second 450 moto, fought back from almost dead last to finish thirteenth in the moto. Paired with a seventh in moto 1, Brayton finished the day just inside the top ten in ninth. - SmarTop/MotoConcepts Mike Alessi, who was also involved in the first turn melee, DNF in moto 2 proved costly as it dropped him for sixth in points to tenth—four behind Josh Grant. - BTOSports.com KTM’s Matt Goerke had his best finish of the season since returning from a wrist injury Washougal finishing twelfth overall. - It was a race to forget for Lucas Oil/Troy Lee Honda’s Malcolm Stewart, who had assorted bike problems and crashed knocking him out of the points in 450 moto one. Then he was briefly on the ground as part of that massive 450 moto one first turn pileup. He fought back for an impressive eleventh. - Jake Canada, who is receiving support from Doug Dubach Racing since returning from a broken arm and after parting ways with SmarTop/MotoConcepts, matched a 450 career high with a tenth in moto 2. Unadilla marked the first time Canada has been inside the top ten since Thunder Valley in 2011—which also marked the last time he raced the 450 Class full time. After that (Thunder Valley, 2011) race, he was picked up by MotoConcepts. Cooper Webb was thought to have broken his arm after a huge practice crash. But the rookie returned to finish 12th overall on the day. - Multiple-time Japanese Motocross Champion Akira Narita had his best finish of the season at Unadilla with a fifteenth overall. - Zack Freeberg continues to churn out his best results of the season in the 450 Class. Since making the switch to the bigger bike at Washougal, Freeburg has two top fifteen performances, including a fifteenth in moto 1 at Unadilla. - Jeremy Medaglia and New York native Bobby Kiniry both made the jump across the border to race Unadilla with the Canadian National in the midst of an off-week. Kiniry, who has also raced Hangtown, Thunder Valley and Southwick this year, finished twenty-second overall following a first moto DNF. Medaglia finished one spot ahead in twenty-first in his first Lucas Oil Pro Motocross action of the season. - Robby Marshall had the Unadilla crowd in frenzy as he was back on his Two Stroke Motocorss (TSM) KTM 250. Marshall finished twenty-eighth overall on the day. - Luke Renzland was expected to make his pro debut at Unadilla but has decided to return to amateur racing for another season.